Last Friday, Jade & Cooper graduated 'puppy manners' class from Sit Means Sit. They are so smart! But first, let me paint a picture of what led us to drop a pretty good chunk of change (though these guys were better priced than anything else I had found) on dog training. If you came to our home, Jade & Cooper would jump all over you. If you came into our yard, Jade & Cooper would jump all over you. We had to use gentle leaders to take them for a walk, otherwise they'd dislocate your shoulder. If there was any type of distraction, we'd get the shaft. Even just an interesting smell on the ground - Jade & Cooper wouldn't listen and do something crazy like come inside. We'd scour the street for oncoming foot traffic before letting them outside (remember? no fenced backyard.) because if someone came down the street without us getting their attention first, we'd have zero control. Mud. Oh, muddy days are hard enough as it is. But Jade & Cooper jumping up on you with muddy paws while you're home from work for lunch is infuriating. Neighbors coming outside unexpectedly while Jade & Cooper are out and its muddy is nervewracking. Neighbors coming outside unexpectedly with their 9 month old daughter is even more nervewracking. Heading into lacrosse coaching season, The Stallion knew my sanity would be at risk. So, we sprung for dog training in order to keep my sanity in tact. And, boy, did it work! Oh my, has it been one of the best things we've ever done. Jade & Cooper are now angels. They still have the desire to jump up every now and again when they're really, really excited, but they catch themselves. And last night we went on our first walk through the neighborhood with NO LEASHES. We were even passed on the sidewalk by 3 girls and a dog, and they stayed right by our side, paying them no attention. Now that - that's the biggest feat we've seen so far. Amazing. We are so much more connected to them now. Before, it was their connection with each other that came first. Now, we have their undivided attention and they're always looking to us to see what's next. That's really what we needed. 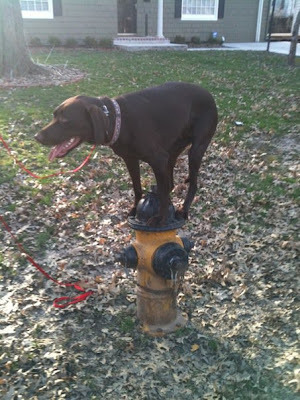 Two of our fellow 'Laners' have chocolate labs, and they are completely sold on signing up their pups, too. They saw the transformation first-hand and are utterly amazed. Feel free to email me at carlyklock [at] gmail [dot] com for the info if you'd like to have perfect dogs, too! You can also get info on their website - just be sure to let them know I referred you, pretty please. Now, about the fire hydrant - wondering about that one? Well, one of the commands you will learn is 'place'. Place means go to the nearest elevated, distinct area you see and stay there until I tell you you can do something else. We have a fire hydrant on our street. It's our favorite 'place' to practice with. Cooper's way too big and clumsy to handle this one, but Jade's close to mastering it. She's much more graceful. I'm so, so thankful that we did this and that are pups picked everything up so quickly. Come visit anytime - even unexpectedly! Isn't it amazing how some schooling can change the quality of life??? Congrats on your dogs and you getting to enjoy each other! PS Are you coming for the 4th of July?